Accessible performances are part and parcel of what venues offer. 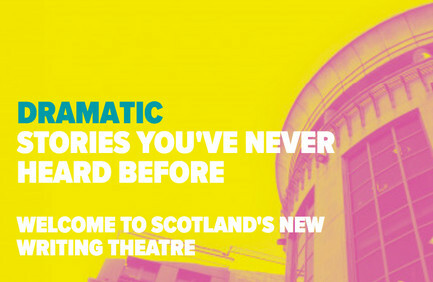 These range from BSL interpreted events through to relaxed performances and captioned shows. These events play an important part of ensuring the artistic offer is available to – and can be enjoyed by – everyone. With more and more people booking online, one of the challenges for venues is making their accessible performances easy to find – and easily bookable – online. 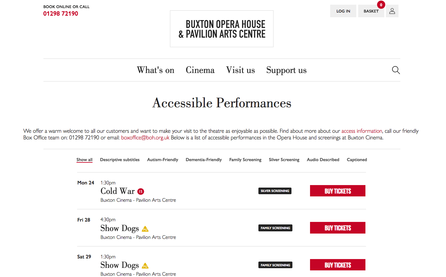 We’ve been working with Bristol Old Vic, Buxton Opera House and Chichester Festival Theatre to improve their online offer for accessible performances; here’s how we’ve done it. Filters are common on websites, often grouping events by genre, date or venue. We know this way of quickly displaying specific shows works well for people visiting the site, helping them quickly find what they need. This is great, and clearly lets people know what to expect during the performance. But for your audiences who have specific requirements it’s time consuming and frustrating to click through every production to find the dates a performance is captioned or signed. To make these performances easier to find, Bristol Old Vic, Buxton Opera House and Chichester Festival Theatre have added specific Accessible Performance listings to their websites so people can quickly see, at a glance, when accessible performances are taking place. These pages bring all the available accessible performances into a single list, along with filters for specific types. These pages are a great way for regular customers to bookmark a listings page. As well as a great source to direct people to via social media, direct marketing and from the Box Office. For the teams at Bristol Old Vic, Chichester Festival Theatre and Buxton Opera House, creating these lists is a simple case of adding attributes to the events in Spektrix or directly in the CMS. Simple tick boxes means it only take a second to add a new event to the listings. Using the Spektrix API, the website queries specific seats to find availability, so we can let people know if accessible seating is available or sold out. I wanted to congratulate you on your new online booking process, which was wonderfully efficient. The online guide for access members was very helpful, and I am hugely impressed by the care you have taken in constructing the system and supporting your access bookers. A big thank you to all concerned. Collate your accessible performances into a single page. This might be a manually updated list, or a live event list powered by your CMS. Use this page as a resources and a direct link for customers via social media, the Box Office, email and from other areas of your site. One size doesn't fit all. It’s not enough to say that a performance is accessible. People need to know if there will be a BSL interpreter, captions, a relaxed environment etc and where’s best to sit. Use categories in your CMS to categorise performances and display relevant information on the website. 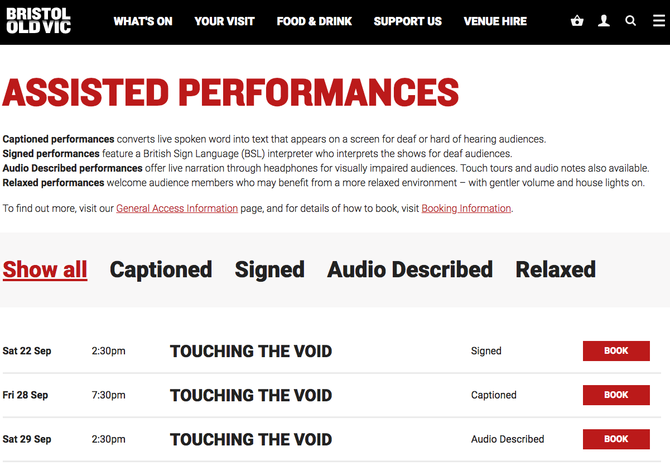 Bristol Old Vic know that everyone has favourites, including favourite BSL interpreters, so they let customers know online who will be interpreting the show. Chances are when you make a change to your website, your customers will have something to say about it. Take the feedback on board and react. 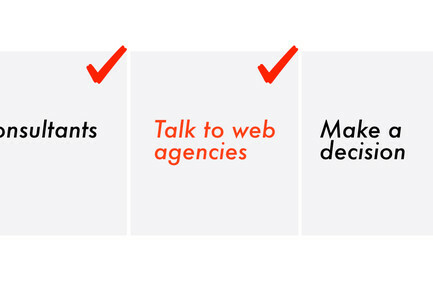 Don’t forget that not every piece of feedback will need an action, but over time you’ll begin to understand which bit of your website is working, and which isn’t. If feedback isn’t forthcoming, don’t be afraid to ask. And don’t forget to celebrate the good feedback! 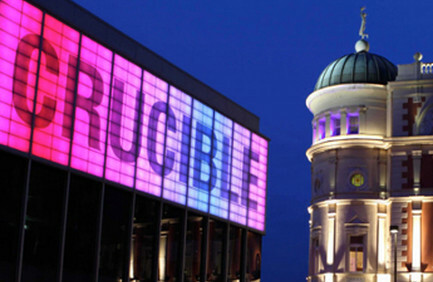 Having information online on how to book accessible performances gives all your customers the resources to book online. 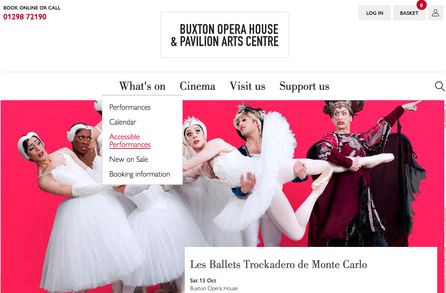 All three organisations have dedicated web pages with information about access provisions available (see examples here - Buxton Opera House, Bristol Old Vic, CFT). CFT have also created online booking guides customers can download, offering customers the support they need to make a booking online. Attitude is Everything: Attitude is Everything work with organisations to make their events more accessible. They also have a host of resources on their website. Euan’s Guide: Euan’s Guide is a review website used by disabled people to review, share and discover accessible places to visit.